Handing over your Droid to one of your children might be an option to entertain them but be aware that one of the highest revenue is generated by advertisement, app and in-app purchases. Sometimes, this might be kind of surprising for you to discover that your credit card has been charged. You should keep an eye on the payment settings on your device, too. Yup, clearly a transaction I'm 100% sure that it wasn't done by myself. Finding the source of this issue was quite easy. I started with a search on Google using the keyword presented on the account statement: 7Druids. Skimming the results brought me directly into the Play Store, and I was presented with quite a number of apps for children and some for grown-ups, too. 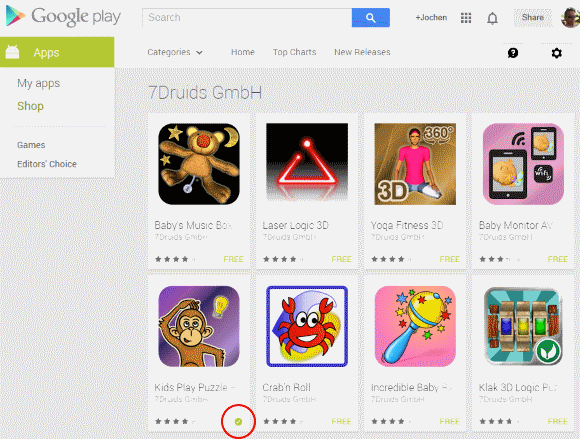 7Druids GmbH has a selection of apps for children and adults. 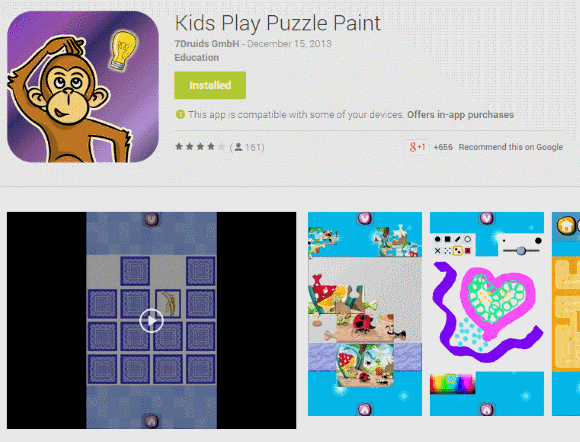 Well, children usually like Kids Play Puzzle Paint. The app seems to be available for free but in-app purchases not. But at least in our house-hold one question remained open: One which device did it happen? Even though the app has been installed already, you can still again on the Installed button and you will be presented with a drop-down selection of compatible devices. But most interestingly, you will also get the information on which smartphone or tablet the app has been installed already. Finding out on which device the app has been installed is visible in the drop down selection. Aha, there we go... Not my one! I guess, I have to have a word with my BWE. Anyway, let's see how we can avoid this kind of unattended in-app purchase. How to prevent accidental purchases? Actually, it's very simple to improve the situation on your device. In case that you have multiple devices running on the same Google account, you have to go through the steps on every smartphone or tablet in order to maximise protection. Adjust the setting of Require password for purchase. By default it's configured as Never. Change it to one of the other available options, confirm the change with your Google account password and you're done. Yes, there are additional options you might take into consideration, like not providing any credit card at all in Google Wallet. In my case, I'm actually using a dedicated credit card which I more or less use for online expenses exclusively. Furthermore, the credit limit on that particular card is very low. In case of the inevitable event the damage won't be too high after all. Did you already have this kind of experience? Do you have any additional tipps and tricks dealing with this kind of situation? Select any in-app purchases that were unauthorized purchases made by a minor and click "Refund." 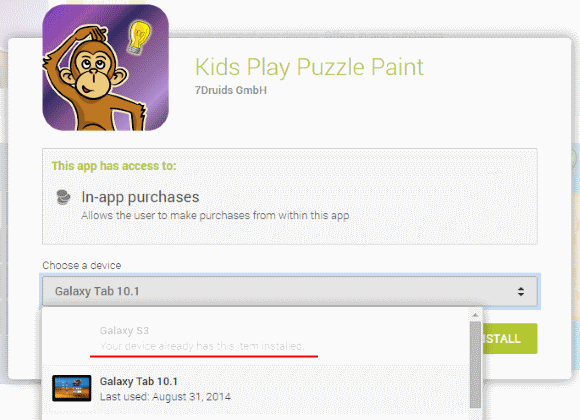 Provide the requested information for any in-app purchases selected and click "Submit." As written by Google the link to request for refunds will navigate you to an overview in the Play Store. Unsurprisingly, the above analysed scenario is listed on top of my potential refunds. This page can be used to request refunds for unauthorised in-app purchases in compliance with Google's agreement with the FTC. 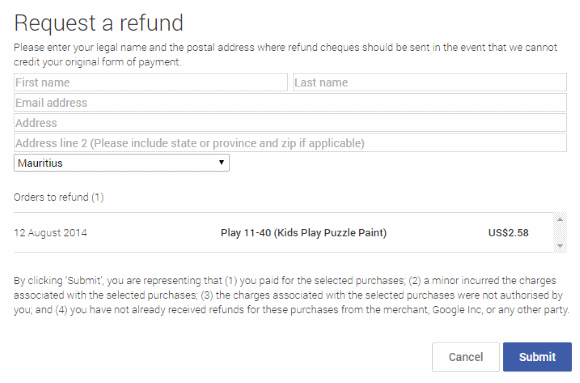 Next, you have to provide your name and contact details in case that Google has to issue a cheque if a refund to the original payment option is not possible anymore. Enter your legal name and the postal address where refund cheques should be sent in the event that we cannot credit your original form of payment. Of course, I requested a refund for this purchase... Let's see what's going to happen. I'm going to update this article accordingly. Seriously, even though the idea of starting a business right after graduation might be tempting, take into consideration that there's a lot to learn and it's definitely not the big bucks you should after. Building your own company takes a lot of energy and investment in terms of time and money. Be smart, learn from others' experience, team up in start-up if you prefer a more flexible life-style.